The primary application for the PMP is pumping condensate from a process application or condensate collection area back to the condensate return system. All PMP Series stand alone units are furnished with pump tank, check valves, and internal pumping mechanism. The PMPSP Sump Drainer is a special PMP designed for pumping water out of low lying areas or pits. It is an excellent solution where there is no access to electricity. Watson McDaniel also offers Pumps with Receiver Tanks which consist of one or more stand alone pump units connected to an appropriately sized receiver tank mounted on a common base. Additional pumping units can be used for increased capacity or pump redundancy in case of failure. Simplex, Duplex, Triplex and Quadraplex condensate pumping systems are available. A Pump-Trap Combination (PMP with Steam Trap) is used when draining condensate from a single piece of heat transfer equipment whose steam flow is being controlled with a modulating type valve. When a modulating valve controls the flow of steam to a heat exchanger, a stall condition can develop. Stall occurs when the modulating valve closes and steam pressure downstream of the valve is unable to push the condensate into the return line and it backs up into the heat exchanger. A pump-trap combination will eliminate this problem. Watson McDaniel Pump-Traps are available with either an internal steam trap (Model PMPT) or an external steam trap (WPT Series). Watson McDaniel’s fully-qualified fabrication facility is ASME Code Certified. Our engineers can design and build complete custom condensate pumping systems to meet all your requirements. PMPC - The Model PMPC pressure motive pump body & cover are manufactured from Ductile Iron. ASME “UM” code stamp is available. PMPF - The Model PMPF pressure motive pump is designed for high pressure applications. Pump body and cover are manufactured fromCarbon Steel and receive the ASME “UM” code stamp. PMPSS - The Model PMPSS pressure motive pump body & cover are manufactured from 304L Stainless Steel. These tanks are designed to be used in harsh corrosive environments and receive the ASME “UM” code stamp. PMPBP - The Model PMPBP is an extremely high-capacity pressure motive pump for applications requiring large transfer of condensate or other liquids. Pump body and cover are manufactured from Carbon Steel. The internal operating mechanism functions identically to other pumps in the PMP series. ASME “U” code stamp is available. PMPM - The Model PMPM pressure motive pump has an extremely low profile. These low-profile tanks are required when draining condensate from process equipment positioned close to the ground which limits the filling head of the pump. 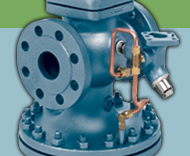 Pump body and cover are manufactured from Cast Iron. PMPLS- The Model PMPLS pressure motive pumps are low profile. These tanks are often required when draining condensate from process equipment positioned close to the ground which limits the filling head of the pump. Pump body & cover are manufactured from Carbon Steel and receive the ASME “UM” code stamp. The PMPSP Sump Drainer (also known as “The Pit Boss”) is a special PMP designed for pumping water out of low-lying areas or pits. Sump drainers are similar to the standard PMP models except that they discharge the condensate vertically upwards. This piping configuration allows them to easily fit into below ground sump pits with limited space. Watson McDaniel manufactures PMPs with Receiver Tanks. The pumps are available in Ductile Iron, Cast Iron or Fabricated Steel. The receiver tanks are manufactured from Carbon Steel. These units come fully-assembled with one or more stand-alone PMP units and an appropriately sized receiver tank, mounted on a frame and skid base. Assemblies are available in Simplex (one pump), Duplex (two pumps), Triplex (three pumps) and Quadraplex (four pumps). The Model PMPT low-profile pressure motive pump has an internal steam trap for applications requiring compact design due to spatial constraints. It is an excellent choice for drainage of various modulating process equipment. The WPT Series are stand-alone pump units with an appropriately sized external steam trap preassembled at the factory and mounted on a common base plate, allowing for easy installation. Pump-Trap combos with an external trap are suitable when capacity requirements exceed internal steam trap designs. These units are available in several sizes and capacities. Watson McDaniel’s fully-equipped ASME Code Certified manufacturing facility stands ready to assist you with all of your fabrication needs. Our engineering staff specializes in the design of Pressure Motive Condensate Pumping Systems for both industrial and institutional applications. You can order either standard packages, available from stock, or specialized systems to meet your specific needs. Contact factory for further information. Watson McDaniel Pressure Motive Pumps are available with several accessories and options. In addition to the items shown above, Watson McDaniel also offers the following accessories and options: ASME Code Stamps, Pre-Piped Pressure Regulating Valves, Drip Leg Stations and Exhaust Lines, and Rebuilt Mechanisms. Watson McDaniel Models W4100 & W4200 Electric Condensate Pumps are used for condensate return applications at temperatures up to 190°F. The pump tanks are available in either Carbon Steel (W4100) or Cast Iron (W4200). Standard features include Bronze-fitted centrifugal pumps, energy-efficient 3450 RPM motors and heavy-duty float switch. Available options include simplex or duplex packages, oversized or Stainless Steel receivers, gauge glass, thermometer, discharge pressure gauge, isolation valves, magnetic starter, mechanical or electrical alternators, 1750 RPM motor, NEMA control panel and high temperature (250°F) components.